Blog post inspired by... the sudden realisation that uni is almost over! You know when you sit down and actually think about where you are in life on this very day and how much has been and gone before? I'm sitting here almost 3/4 of the way through my fifth and final year of university. I'm very much on the verge of adulthood. Maybe you still have those exciting few years of university ahead of you. I my friend have not and well, you suddenly realise that five years can pass in a blink of an eye. I always was so skeptical of my parents when they said that years go so fast once you're not wee anymore, but reluctantly you have to admit they're right. I moved to Aberdeen almost five years ago as a nervous, naive and excited eighteen year old. I had no idea what to expect from the big move. But five years later, I'll admit university has been everything and more that I ever hoped it would be. I know that university isn't for everyone, and for a while prior I wondered if it wouldn't be for me too but I'm so happy I made that leap, moved away from home and took a chance on a little grey city. I quite often read thought-provoking blog posts about why people dropped out of university and why that was right for them. I think quite often its seen as the wild, creative or courageous thing to do. And often it is. 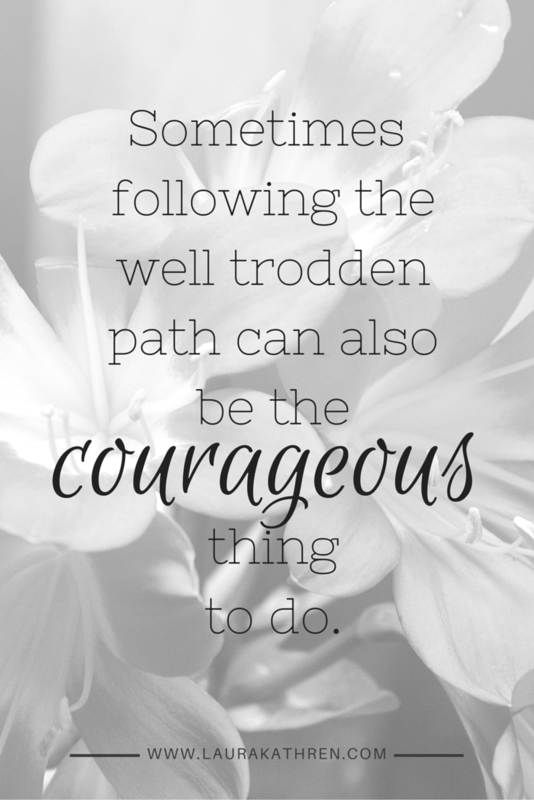 But sometimes, following the well trodden path can also be the courageous thing to do. By following the vast number of our peers in this day and age to university you're not just being a sheep (well hopefully you're not). You're taking one of the biggest leaps into the unknown that you can at a tender age. You're often taking the plunge to move away. You're committing to a course that most of the time you've no idea how will pan out. You're throwing yourself into a hive of strange people hoping that somewhere in that sea you'll find someone alike. You're also taking that chance that so many others in the world sadly don't have, to educate yourself further. You're braving the world alone and saying 'hey, I can do this'. It's not necessarily the right, the wrong or best decision. You're just making a different decision from someone else on how you feel at that time and that's okay. When I sit and consider where some of my school chums at home who didn't go to university are I'm not afraid to admit that sometimes I wonder if I made the right decision. Many of them now have climbed up quite a few ladders in their chosen industry, they're a lot more financially stable than I am, they've got flats and houses in their own names and some are even engaged, married or have started families (though this aspect is not one I'm ever jealous of). Sometimes I wonder if university has meant that I'm only really going to be starting my life now and perhaps I'm going to be five years behind in life. I'll in fact only be fully qualified when I'm 25, over 7 years after leaving school. But then I think again of all the things I've achieved at university and I realise that taking this path has perhaps just made me as mature as those people, but in a completely different way. We now both have life experience and life skills but of a very different kind. University to me personally signals opportunity and choice; a place to develop yourself and discover yourself. I owe this university and this city a lot, having found life, love and a lot of memories here. And after my final year (so far) being the best year of five I'm just not quite ready to let it go. Here's hoping the next two months don't speed past me as fast as the first five, though I'm pretty sure they'll disappear even quicker. Did you go to university? What were your experiences of it? I know these feelings so well, especially the thing of "feeling behind" bothered me from time to time. But you know what the great thing is of going to university? You have time. You have so much time to explore yourself and to explore the life you want to live. When looking back, I know that right after school I wasn't really ready to know what I wanted to do (sometimes I'm still figuring it out today, ha!) and I am glad that I was given the opportunity to study.